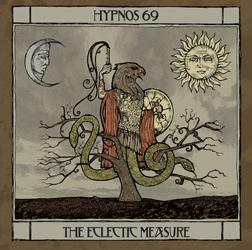 Hypnos 69 - "The Eclectic Measure"
Hypnos 69 were... yes, were, the band have disbanded, from Belgium. The band put out 4 records, each one quite different from the one before it. This being the most distant from anything they played before but also the best they ever did, in my opinion. This takes us back to a Pink Floyd meets King Crimson sound but with the cool Hypnos vibe. This is quite an impressive piece of work with amazing artwork and the whole CD tells a story as well. The title track is very Pink Floyd inspired (Wish You Were Here Era) but with a King Crimson style vocal. Forgotten Souls is a very moody piece. My Ambiguity of Reality is a more hard rocking Hypnos style rocker but the early 70's Crimson sound is very present. If there is one weak point on the CD it is the horn playing. It is in the right places but the players just don't take the music to another level with their playing, while the rest of the band are phenomenal. Wow. Halfway to the Stars is a bit Motorpsycho like and a nice ballad track that leads into I and You and Me (II), a nice acoustic track, before the very cool King Crimson Red era track (Ominous) that is very influenced by 21st Century Schizoid Man! The Point of No Return is one of the best tracks on this brilliant CD and a great composition. Deus Ex Machina ends this amazing CD, sadly the last one by this band. I hope this will be released on vinyl as it deserves it. Fantastic artwork and music. Another Elektrohasch winner. For more information you can visit the Hypnos 69 web site at: http://www.hypnos69.tk.